The US Centers for Disease Control (CDC) has hailed water fluoridation as one of the top 10 public health achievements of the 20th century. So, for the first time, the US Department of Health and Human Services (HHS) lowered its recommended level of fluoride in drinking water7,8,9 by 40 percent, from an upper limit of 1.2 milligrams per liter (mg/L) to 0.7 mg/L. 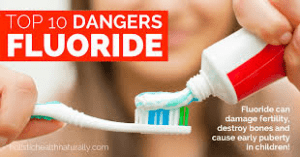 A number of studies10,11,12,13 have shown that children who with moderate to severe dental fluorosis score worse on tests measuring cognitive skills and IQ than peers without fluorosis — a clear revelation highlighted in the film, as some still insist that dental fluorosis is nothing more than a cosmetic issue. As stated, fluoride is a drug, and research into the health effects of fluoride is based on pharmaceutical grade fluoride. However, a majority of water authorities do not even use pharmaceutical grade fluoride; they use hydrofluosilicic acid, or hexafluorosilicic acid — toxic waste products of the phosphate fertilizer industry, which are frequently contaminated with heavy metals such as arsenic, mercury, cadmium, lead, and other toxins. This is a key point that many fluoride proponents fail to address when arguing for its use. Indeed, holding elected officials accountable for procuring proof that the specific fluoridation chemical used actually fulfills fluoride’s health and safety claims and complies with all regulations, laws, and risk assessments required for safe drinking water, has been a successful strategy for halting water fluoridation in a number of areas around the US. Ninety-seven percent of Western European countries do not fluoridate their water, and data collected by the World Health Organization (WHO) shows that non-fluoridating countries have seen the exact same reduction in dental cavities as the US,16 where a majority of water is still fluoridated. If fluoride were in fact the cause of this decline, non-fluoridating countries should not show the same trend. Other natural strategies that can significantly improve your dental health is eating plenty of fermented vegetables, and doing oil pulling with coconut oil. Also make sure you’re getting plenty of high quality animal-based omega-3 fats, as research suggests even moderate amounts of omega-3 fats may help ward off gum disease. My favorite source is krill oil. This entry was posted in Alternative Medicine, Human Behavior, Lifestyle Health, Medical Studies, Odd Medical Practices, Tele-Medicine, Telemedicine Reporter, Vitamins - Supplements and tagged a Neurotoxin, adhd, dental fluorosis, endocrine dysfunction, endocrine-disruptor, fluoridated water consumption, hydrofluosilicic acid, Hypothyroidism, infants Overdosed on Fluoride, National Telemedicine Foundation, NTF, oil pulling with coconut oil, reduced IQ, reduced thyroid function, Short Film Reveals, Telemedicina Mexico, telemedicine, the Lunacy of Water Fluoridation, traditional diet, US Tele-Medicine by Admin. Bookmark the permalink.